From Osnabr�ck train station take bus no. 21 (direction Lotte Kreisel Atterfeld) from bay 1 (Bussteig 1) of the bus station in front of the train station to stop "Sedanplatz" (15 min. bus ride). From the bus stop it is a 2 min walk uphill Albrechtstra�e. The physics department is on your right hand side. It is a brick stone building with blue window frames. Entering the main entrance, turn to the right to south-east staircase. Go up to the third floor and proceed to the floor on the left hand side (east wing) to room 32/365 (Michael Reichling) or 32/377 (secretary). 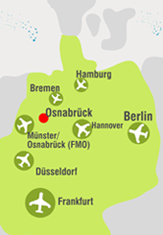 Osnabr�ck is well connected to German and European railway lines and major airports in the northern part of Germany. The closest airport is M�nster/Osnabr�ck (FMO). From FMO airport it takes about 30 minutes by bus (X150) to reach rge city centre. A taxi ride from the airport to the department costs 30 to 50 euro depending on traffic conditions and taxi company. The fastest access to Osnabr�ck is via highways A30(E30) and A1(E37); the closest exits are Osnabr�ck-Hellern and Osnabr�ck-Hafen, respectively. Further directions and routes are available from the map service. A large parking area is available on the north side of the physics building.